I can always rely on Gordon Korman's books to make me laugh. 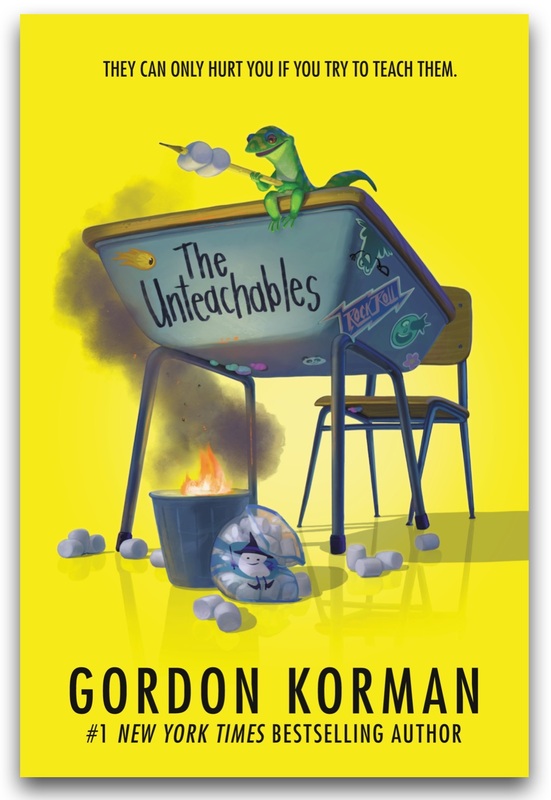 But, with The Unteachables, for the first time, Gordon Korman has made me cry too. Maybe it's because I'm a teacher. Maybe it's because an injustice is righted. Maybe it's because a motley group of kids steps up in a big and meaningful way. Whatever the reason, The Unteachables delivers more than expected, just like the students in Mr. Kermit's SCS-8 class. In a comedy of errors or even negligence, Kiana Roubini who has moved in with her father and stepmom and baby brother while mom is off shooting a movie ends up inappropriately and unregistered in class SCS-8, a self-contained special grade eight class at Greenwich Middle School. The only other students in the class are the angry Aldo Braff; Elaine ("Rhymes with pain") Ostrover; Barnstorm Anderson, an injured jock who had been passed year after year but did no work; quirky comic-movie-TV fan Mateo Hendrickson; Rahim Barclay who sleeps all day; and Parker Elias, farm boy for whom reading is just an endless barrage of confusing anagrams. Their teacher is Mr. Zachary Kermit who, though once a dedicated and inspiring teacher, was ruined by a cheating scandal twenty-two years earlier in which he had no part but for which the superintendent, Dr. Thaddeus, is determined to make the man pay dearly, forever it would seem. Mr. Kermit, or Ribbit as his class calls him, was the teacher of a student, Jake Terranova, who'd stolen and sold copies of the aptitude test, marring the reputation of the school at which Dr. Thaddeus was then principal. Now after years of reassignment after reassignment, Mr. Kermit is coasting until his early retirement at the end of the school year. Unfortunately, Dr. Thaddeus is not going to let that happen. To the whole school, SCS-8 is the class of Unteachables and Mr. Kermit is happy to accept that. He gives them worksheets that he never grades and works on his crossword puzzle. As long as they don't burn the school down, he's okay with whatever they do or don't. But, enthusiastic young Miss Fountain next door is determined to foist her primary class management ideas on him and his students. Worse yet, she engages car dealership mogul Jake Terranova, the cheating scandal lynchpin, to interact with the kids, hopeful that a reconciliation may return Mr. Kermit to great teaching. As in life, Gordon Korman's novels are filled with a plethora of characters, all with their own foibles and strengths. By alternating the voice of the chapters between Kiana, Parker and Mr. Kermit, along with Mateo, Aldo, Barnstorm, principal Mrs, Vargas, Dr. Thaddeus and Jake Terranova, Gordon Korman embeds perspective and perception, not always accurate but always telling. Though there is redemption for those who never should have needed to redeem themselves, The Unteachables makes sure to impart positive messages about learning and teaching, and that no one is unteachable. With a dedication "For all teachers who soldier on" Gordon Korman has written a story for the students and their teachers that inspires everyone to do their best because the impact of that choice may never be identified but it will undoubtedly be realized.